Header cards (or bag toppers) serve two purposes: it gives you a way to seal off poly bags so products don’t spill out, and it helps with product branding. 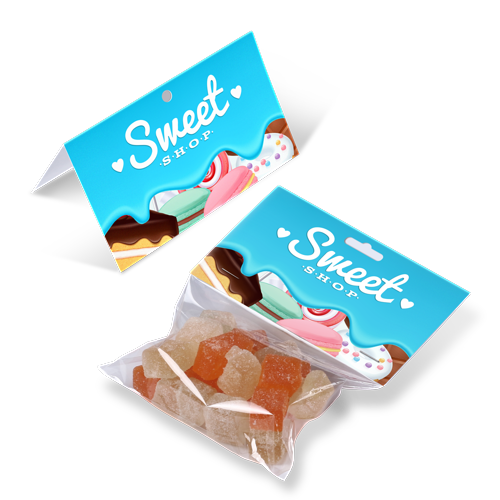 Header card printing is popular because the simple toppers are a cost-effective packaging solution. You can even add holes on top (small round hole or sombrero-style) so they can hang on a stand or rack. Custom header card printing is available on the inside of each as well so you can add product information, directions for use, and other relevant information that will be useful to customers. These toppers are easy to use. They’re simply folded over the poly bag and are usually stapled or glued together. While they are great for those in the food or supplies industry, there are other applications where you can use header cards as well. If you’re having an event and will be giving away gift bags, use a custom header card to commemorate the event. Popular sizes include 3” x 4”, 4” x 4”, and 6” x 5” which all fold in half to half that size. Our printed header cards are scored for easy folding and are shipped flat to you. We also have an online design tool you can use to create your artwork or you can download a header card template to make designing easier.